Pz.Sfl. für 12,8 cm K40 "Sturer Emil"
The Sturer Emil (officially 12,8 cm Selbstfahrlafette auf VK30.01(H) (12.8 cm Self-Propelled on VK 30.01 (Henschel)) is a Rank III German tank destroyer with a battle rating of 5.3 (AB/RB/SB). It was introduced in Update 1.59 "Flaming Arrows". The Sturer Emil is quite similar to the "Dicker Max"; no armor, excellent gun, great gun depression. Due to its limited horizontal gun traverse, it can be a little trickier to use in urban maps, but it can still be used to guard positions as long as cover is available. Being unarmored, always avoid being shot at. Tracks at the lower glacis and superstructure front provides +15 mm armour. Ammo racks of the Sturer Emil. 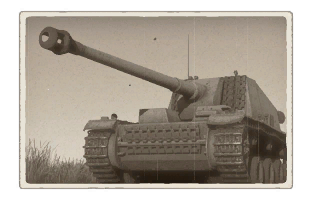 The Sturer Emil is best used at long range due to its thin armour and lack of turret. Alternatively, if cover is available, it can be used behind the cover to destroy enemy vehicles that drive in front of it. Beware that if used at close ranges with cover, it will take a long time to reload leaving it in danger of being overwhelmed by enemies. As a general rule, use the Sturer Emil as a support tank. It lacks the mobility to reposition itself strategically or the reverse speed to "shoot and scoot." As such, the Sturer Emil should do its best to integrate itself into friendly groups, using them as armour and cover. This is especially important as the Sturer Emil is better equipped to engage heavy opponents such as the T29 or T95 than the 75 mm KwK 42 and 88 mm KwK 43 counterparts or equivalent heavy tanks are longer range. If nothing else, remember that the Emil does not reward aggressive playing. Though the Sturer Emil can destroy most enemies it faces, planes in particular can be deadly as they can incapacitate its crew and damage modules since it is open topped and thinly armoured. Outstanding gun depression, same as the "Dicker Max"
Deals a lot of damage, will destroy any enemy in one shot. Has little to no problem getting uptiered as it's gun is more than adequate at dealing with foes at it's BR spread. Five fairly spread out crew members. Has tracks covering the lower glacis and the gun cheeks. 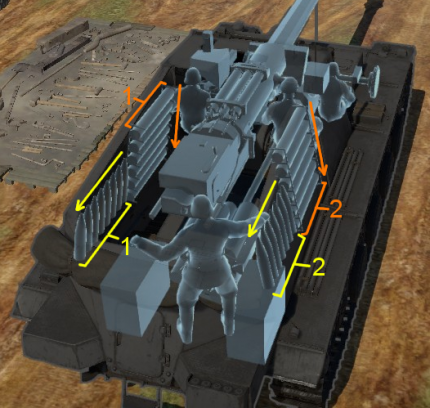 AP shells with HE filler will have little trouble doing damage. 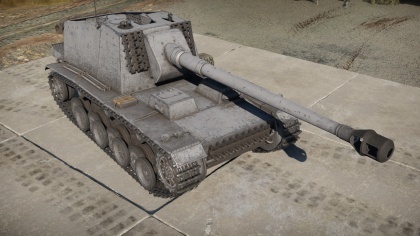 It's a no-brainer successor of the Dicker Max, as their players should feel at home playing the Sturer Emil. Gun sight is not in parallel with the gun (SB). Vulnerable to artillery barrages and strafing planes. The Selbstfahrlafette auf VK30.01(H), or better known as the Sturer Emil (Stubborn Emil), was a heavy self-propelled anti-tank gun developed by Nazi Germany sometime in 1941 and 1942. The Sturer Emil mounted the extremely large 12.8 cm gun on a extended chassis from the cancelled Henschel VK 30.01 armoured vehicle. The gun was laid on the back with the engine in the middle and the driver up front. Not too much is known about the vehicle, only two were ever made in 1942, but they were involved in the Battle of Stalingrad. One was destroyed, but the other was captured during that battle in January 1943. When it was discovered, painting on the barrel indicates a score of 31 tank kills before its demise. The sole remaining Sturer Emil remains at the Kubinka Tank Museum in Russia. This page was last edited on 5 January 2019, at 08:01.